LONDON (AP) — New look, same old dominance for Roger Federer at Wimbledon. The 36-year-old Swiss star never faced a break point and showed off the full repertoire of shots that has made him the most successful male player at Wimbledon. The only things unfamiliar about Federer were his clothes. He wore a Uniqlo outfit for the first time after ending his career-long apparel partnership with Nike. But it clearly had no effect on his game. Federer is looking for a record-extending ninth title at the All England Club but only needed to step onto the court to create a bit more history. 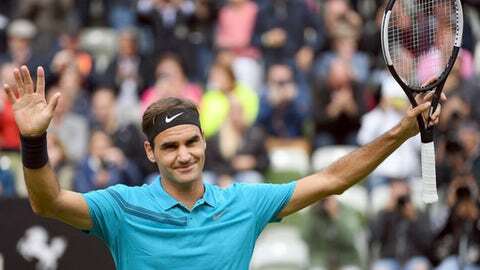 He is the first man in the Open era to play in the grass-court Grand Slam for a 20th straight year. Before stepping off the court, he gave his headband to a young female fan in the crowd — and joked he could be giving away a lot more before the fortnight is over. The girl had held up a sign saying, “Can I have your headband pleeease! !”, and a post-match interviewer pointed out that Federer could expect more requests in coming matches after fulfilling her wishes. “Yes, they want a watch, a car, a racket, a shirt, they can have it all at this point,” Federer said. Last year’s runner-up Marin Cilic also advanced easily with a 6-1, 6-4, 6-4 win over Japanese player Yoshihito Nishioka. The third-seeded Croatian hit 21 aces and a total of 44 winners — compared to one ace and six winners for Nishioka — to complete victory in 1 hour, 46 minutes. American Sam Querrey, who lost to Cilic in the semifinals last year, had a similarly comfortable start as he beat Jordan Thompson of Australia 6-2, 6-4, 6-3. In women’s play, U.S. Open champion Sloane Stephens became the first contender to go out as she lost 6-1, 6-3 to Donna Vekic of Croatia. Having backed up her 2017 U.S. Open triumph by reaching the French Open final last month, Stephens was considered a title hopeful. Last year’s semifinalist Magdalena Rybarikova also exited, losing 7-5, 6-3 to Sorana Cirstea of Romania.